It is rated a fourth tier university for lack of any lower tier, and its law degrees are often considered especially worthless, since you need only know five or more of the ten commandments to pass. Despite its distinct lack of academic distinction, it has a terrfic reputation for evilness, with several of its alumni counted amongst the world’s most evil people. During terms, the university campus is shrouded in such a miasma of maliciousness that sensitive people can feel it as a vague uneasiness from as much as 200 miles away. 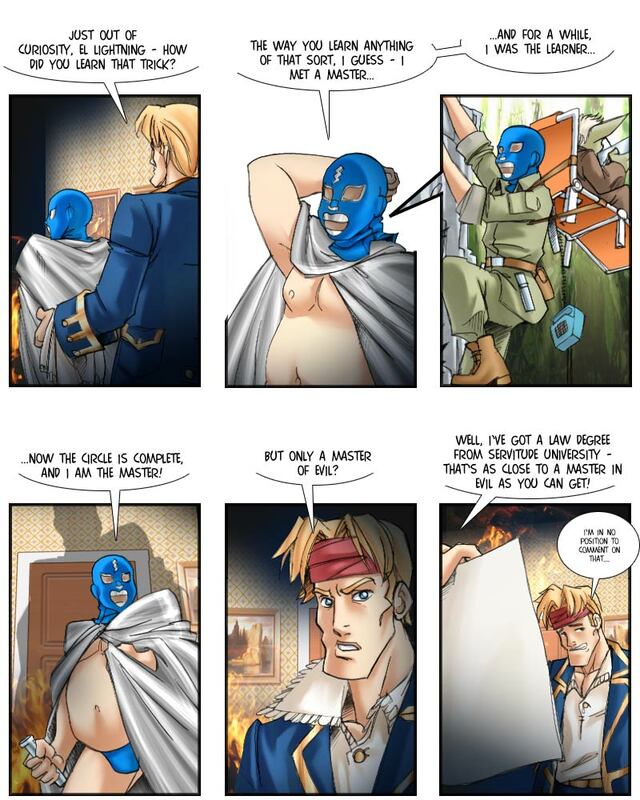 While Servitude U isn’t exactly supportive of Hispanic students, El Lightning Blue had the advantage of not being immediately recognizable as one – he fit in perfectly with all the other students wearing bizarre masks 24/7. And, yes, in panel four El Lightning is casting a looming shadow on a blazing flame – you can do that in B-movies, since the flame is only physical, but the shadow is psychological. Of course all Servitude University is completely fictional, and any similarity to any extant institute of higher learning is unintentional and completely coincidentally. Also: sad.